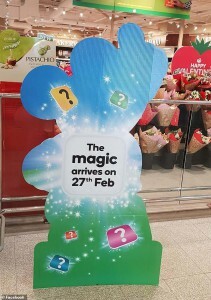 It appears Woolworths could be preparing to launch a brand new Disney-themed collectable to rival Coles Little Shop campaign. While nothing has been confirmed, an excited mother took to Facebook recently to share a snap of a cardboard cutout out the front of her local Woolworths store. If the rumours are true, the supermarket giant is set to release a range of Disney-themed collectable Scrabble tiles. ‘Members let the fun begin,’ the mother wrote in a Facebook group dedicated to the collectable trends. The photo she shared appeared to be the outline of famous Disney character Mickey Mouse and words written on it confirmed ‘the magic’ would arrive at the end of the month. If you recall back in 2016 Woolworths launched the Disney movie collectables. This could be a follow up to that campaign? Or Could it be another dominoes collection like in 2015? This could be so much bigger and better than the latest Coles Stikeez craze!? Will have to find out what they are before I know if it is worth it. I would rather a collectible to play with than cards or dominoes. I go just occasionally to Woolworths so this collection is not of much interest to me. I really wish woolworths and coles would spend less money on giving crappy toys, but give give us less to spend at the cash registers. Oh I love this! I absolutely love Disney! These might actually be used to teach children how to match numbers or pictures. I really am getting tired f these.